Each candidate for membership in PTK, must have completed 12 credit hours that may lead to a declared associate’s degree, with a grade point average (GPA) of a 3.5 on a 4.0 scale, currently enrolled in six credit hours, and adhere to the school code. A cumulative GPA of 3.25 must be maintained to remain in good standing. 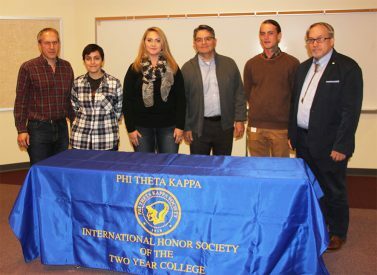 (left to right) Dr. Philip Kaatz, PTK Advisor and Math and Physical Science Faculty; Beverly Harb and Cassy Loedolff, PTK Inductees; Dr. John Groesbeck, President of Mesalands; Dylan Germaine, and Kenneth Hoke (not in photo), PTK Inductees; and Dr. Forrest Kaatz, PTK Advisor and Director of Institutional Research, took a quick photo at the induction ceremony.